what to do when you have to evacuate because of an earthquake. 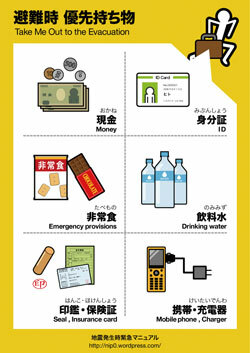 We created this guide hoping it will be useful for foreign people living in Japan and who are suffering from the 3.11 earthquake. It almost past one year after the nightmare. Nothing is completely recovered, but everyone try to restart. PS: Be sure to check your contry’s embassy information too. Please link to this website. You ca also print this guide. Let know your friend about this site with the site banner.